Harley is a five-year-old German Shepherd who lives in Omaha with Rudy, a seven-year-old Labrador Retriever. During the day, they are joined by mixed breed Chevy, a nine-month-old puppy who lives with their guardian’s sister. Their humans set up this dog behavior training appointment to get Chevy to calm down and listen and stop jumping up. They also wanted me to put a stop to dog barking and train the dogs to stop pawing or nudging them for attention. I have seen a lot of excited dog behavior oner the years, but Chevy’s jumping issue was pretty impressive. Not only did he jump up many times, he has a pretty amazing vertical leap as you can see in the video below. Chevy was so worked up I use a dog behavior trick to get him to stop going crazy; spazzing around the room. I pulled out a leash and gave him a leash time out to settle him down. It took several minutes as this is one high energy and excited dog. Because of the dog’s size and demeanors, I spent several minutes asking about the dog’s daily exercise and activities. While Harley and Rudy are too heavy needing to loose weight, Chevy has so much energy he needs multiple exercise actives to burn it off effectively. Another suggestion was to move to a structured feeding ritual rather than leaving food in the bowl all the time, aka free feeding. Because eating is such a primally important activity for dogs, adding structure and control to feeding time can help the dog develop more control while simultaneously increasing their respect for the humans. Speaking of structure, all three dogs were pushy when they wanted attention or affection from a human; nudging for attention or jumping up on the human. Because of how aggressive they were when demanding attention, I suggested the guardians start practicing my Petting with a Purpose method. You can learn how to apply this technique with your own dogs by watching the video below. I recommended Chevy’s guardian start a daily exercise journal and start notating his daily activities. Counting the number of fetches, length of walks and play time with the other dogs will help the guardian get a feel for how much exercise he needs each day to drain his seemingly endless supply of energy. When you have a higher energy dog, I have found quick games of fetch sprinkled throughout the day can work wonders. I also suggested the guardian take Chevy out for a quick game of fetch any time he got a case of the zoomies or plays too rough or excitedly with Rudy or Harley. Next I shared some tips to stop Chevy from jumping up and mouthing. Because he is still just a puppy, I recommended his guardian enroll him in our mature puppy socialization classes as playing with other pups of a similar age and maturity level can help eliminate or reduce many dog problems. 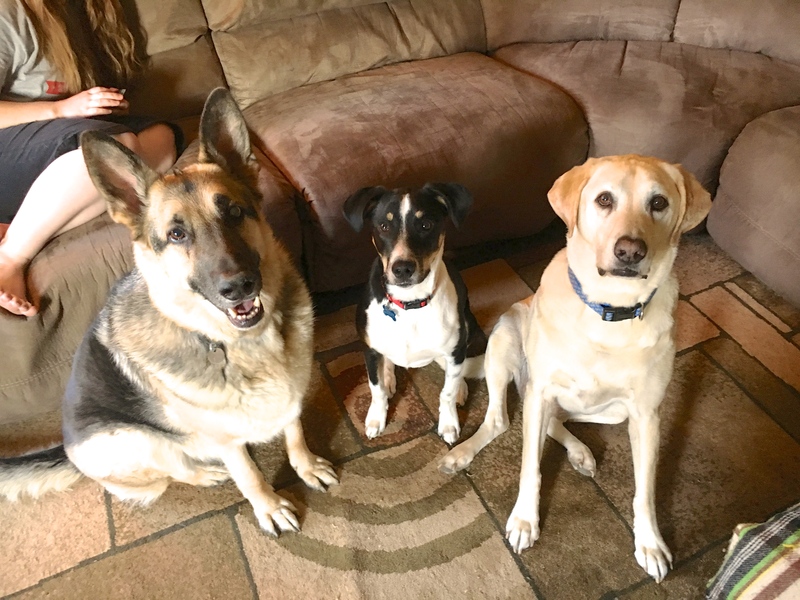 Because Chevy was so out of control, I had the guardians put the other two dogs outside so I could show them a few exercises that will tap into the dog’s ability to focus and look to their humans for guidance and leadership. By the end of the session, Chevy was starting to sit in front of a human to pre-pay for his love and affection. I always love seeing dogs take what they learn and start applying it to real world situations. Chevy is one smart puppy. We finished the session with a structured feeding before filming a roadmap to success for the guardian’s that you can watch below.